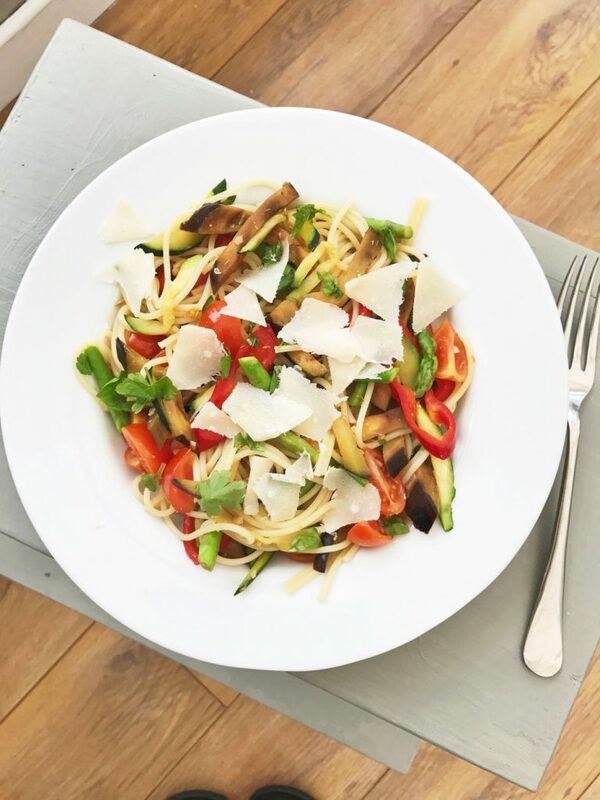 Our very veggie spaghetti is perfect for midweek dinner, it’s quick and easy to make, counts towards your 5-a-day and tastes delicious. In the time it takes to cook the spaghetti, just chop and cook up the Mediterranean style veggies and mingle everything together onto the plate. A really easy, healthy quick recipe. Put the spaghetti on to cook in a pan of boiling salted water, with a swirl of olive oil as per packet instructions. Add a splash of olive oil and knob of butter to a frying pan, tip in the garlic, courgettes, aubergine, pepper and asparagus and fry over a medium heat for around 7-8 minutes, until softened. Stir in the ground fennel seeds and mix well to spread the flavour. Turn off the heat and add the quartered tomatoes. Once the spaghetti has cooked, drain it in a colander and keep a little of the water in case you want to loosen the spaghetti. Mix everything together and tip onto plates. Scatter over torn basil and Parmesan shavings. Add in different or more veggies, mushroom and fennel work well. Toss in some chorizo sprinkles or chopped ham. Add spice with a pinch of chilli flakes. Top with toasted flaked almonds or pine nuts. Skip the fennel and toss the spaghetti with pesto before adding the veggies. Serve just as it is in shallow bowls, maybe add a green side salad or garlic ciabatta slices. Serve alongside roast chicken as a lighter alternative to Sunday roast. Leftovers are fab cold next day as pasta salad.